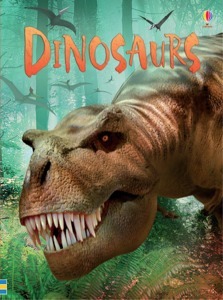 Click on a link to visit the recommended websites or to hear how to say the dinosaur names in the book. Watch a video clip about dinosaurs. Find out about the Stegosaurus. Fun facts about Tyrannosaurus rex. Dig up some dinosaur bones! My son received this book for his 5th birthday and we have found it a great little book, full of interesting facts, colourful pictures and just the right length to keep him interested until the last page. I am now looking to buying some of the other titles in this series. Hello i'm reviewing this book - my daughter has really enjoyed it. It's really simple and it's exciting and it makes it easier to understand for her!